There are new insights and possible new treatments available to you! 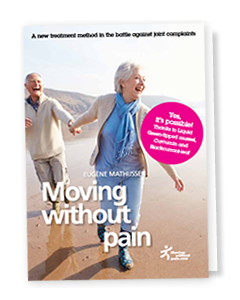 You can download the free booklet ‘Moving without pain’ that provides useful information based on the latest research and treatments. Already more than 100,000 people have ordered the free booklet and are benefitting from a new approach to arthritis and pain. The average appreciation of the booklet and its solutions has been 9.2 out of 10. You will be automatically forwarded to our payment provider PayPal to pay the shipping costs of 1.95 GBP. Following confirmation you will receive an e-mail at the filled out e-mail address. In this e-mail you will find a link to download the booklet. Note: We publish from time to time a ‘Moving without pain’ newsletter with an update on all the latest insights that we will sent to your e-mail address. If you don’t want to receive this newsletter, then you can easily unsubscribe immediately after you have downloaded the booklet or at any moment thereafter. The booklet “Moving without pain” provides insight into arthritis and rheumatism and informs you about the latest insights for the treatment of chronic joint problems and the common complaints such as inflammation, pain, stiffness and reduced mobility. An increasing number of people suffer from chronic joint problems. For example, in the U.K. as many as 8.75 million people suffer from arthritis and in the U.S. 27 million which is 1 out of 4 adults over the age of 50. One of the solutions to this increasing and important problem is the discovery of powerful, natural anti-inflammatories Curcumin, Green-lipped mussel and the Blackcurrant leaf, which independently, but even more when combined, lead to significant improvements in the symptoms and complaints that result from chronic and rheumatic joint diseases. Order or download the Moving Without Pain booklet for free now. More than 100.000 readers preceded you! The booklet scores an average of 9.2 out of 10.